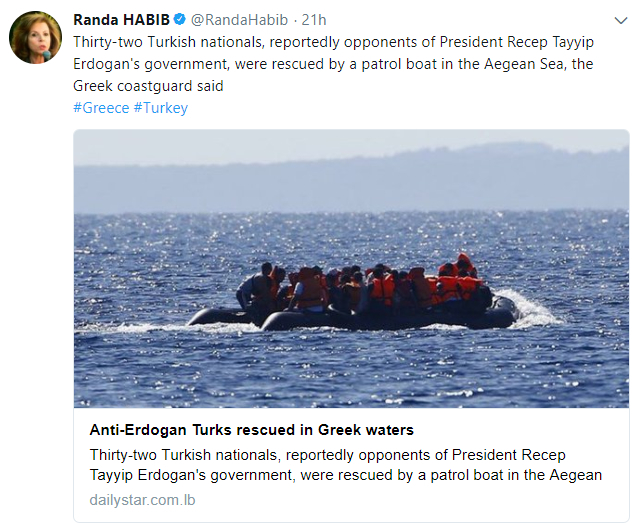 Thirty-two Turkish citizens including academics, teachers and doctors have applied for asylum in Greece after being detained by Greek Maritime Security forces on an Aegean island where they arrived illegally, the Greek Kathimerini daily reported on Saturday. “All state workers or teachers, the Turks claimed they feared persecution in their country, where Turkish President Recep Tayyip Erdogan launched a purge of the civil service and armed forces after a failed coup in 2016, the daily stated. According to a September report in Kathimerini, at least 995 Turkish citizens have applied for refugee protection in Greece after fleeing a post-coup crackdown at home. In a similar development, a former police chief identified as E.S. was detained along with his wife and two children while they were allegedly on their way to escape to Greece, Anadolu reported on Saturday. Anadolu said on Friday that at least 12 people were detained near the Turkish-Greek border in the western province of Edirne. Turkish President Recep Tayyip Erdoğan and his government accuse the Gülen group of masterminding a failed coup attempt in Turkey on July 15, 2016. Turkish Interior Minister Süleyman Soylu said on Dec. 12 that 55,665 people had been jailed and 234,419 passports revoked as part of investigations into the Gülen group since the failed coup attempt on July 15, 2016.